The quest for a high-quality carbon fiber bow was clearly a challenge that could be attempted only by a bow maker with an international reputation. Even with the successful production of the first Spiccato®, persuading the classical music world became a marketing crusade. Today, Spiccato® is played worldwide by students as well as professionals. Benoît Rolland’s groundbreaking invention paved the way for the now numerous manufactures of synthetic bows. Drawing from his experience and systematic observations, Benoît Rolland started with exhaustively listing the qualities and specifications of a fine classical bow; he thus achieved a conceptual model for Spiccato® with its such specification. Followed a period of several years, during which Benoît designed for himself an intensive program of education and research, reading, experimenting, and corresponding with physicists. Eventually, he succeeded in perfecting the formulation of the composite concept and know-how which responded to his specifications: playability, bowing stability, sound, but also aesthetics with some likeness to Rolland’s classical line of bows. The model sustained the stress of the tension mechanism. Designing the inner adjustment mechanism was in itself a challenging process that required a great deal of materials testing. 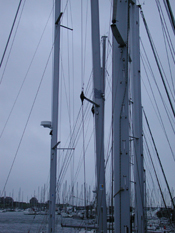 Benoît built upon his familiarity with structures and riggings of sailing boats stressed at sea. He made his first Spiccato® prototypes with marine techniques and materials. 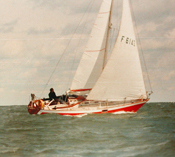 Benoît Rolland’s initial choice in 1985 of composite fibers came from his lifelong passion for racing sailboats. In the course of life on boats, he became familiar with the properties and behavior of materials such as carbon fibers, glass fibers, Aramid fibers (as Kevlar®), epoxy and polyester resins, spectra fiber and nylons. Besides the resistance of the materials, he tested their musical potential. Among these many possibilities, carbon based fibers emerged as the clear choice for a high-tech, manufactured bow. Most of this research, design and testing for Spiccato® was supported by Mr. Rolland personally and Rolland’s Company, with additional funding from grants, awards and investors. Patenting the mechanism was yet another learning! In 1991 the first Spiccato® bows were produced from molds. By 1993, the testing years allowed for the production of 500 bows that soon found their way into the hands of orchestra musicians throughout the world. Rolland designed and made the molds, refinished and adjusted each bow himself. The Spiccato® bows personally made by Benoît Rolland are now sought after by top string players, and have even been acquired by some Japanese collectors. The unique combination of custom composite materials, physical design and patented tension mechanism culminated in a bow that remains stable over time and will never be out of shape; a bow that is impervious to shifts in humidity and temperature, harder than wood, and therefore potentially more powerful in sound volume. From the very beginning there were two goals: Spiccato® had to be as good as the best traditional bows of its range, in playability, weight and balance, while preserving a quality of aesthetics. While it is true that Benoît Rolland’s carbon fiber bow is a manufactured product, it nevertheless carries the Benoît Rolland® imprint. As with his wood bows, the two brands Spiccato® and Arpège (under its initial design at Rolland’s French manufacture) were originally molded from Rolland designs. This marriage of elegance and technology is the superb fulfillment of Rolland’s fifteen-year pursuit of a unique vision. Benoît Rolland terminated in 2005 his collaboration with the American company that manufactured during a few years Spiccato®. Benoit is currently working on the new generation of Spiccato® and will announce its release on the market. No bow is currently authorized to be manufactured as Spiccato® or as a likeness of it.